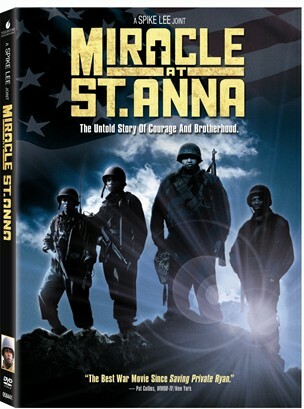 The opening scenes of Miracle at St. Anna set up the movie as a mystery involving a New York City postal clerk, working the stamp counter, who recognizes his next customer and suddenly pulls out a German Lugar and kills him. Detectives later find in his house, the head of a statue from Florence worth about $5 million on the black market. From the start, the movie sets up some intriguing questions like how did a postal clerk get his hands on a Florence relic, why did he kill the man, and why did he use a German Luger? Too bad the movie doesn’t deliver, and leaves the viewer very disappointed. The movie is mostly set in Italy during the second World War and focuses on Hector (Lax Alonso), Bishop (Michael Ealy), Stamps (Derek Luke), and Train (Omar Benson Miller) four black solders in a white men war. When we first meet Train he is already carrying the head, he believes it will bring him luck. Train saves the life of boy named Angelo (Matteo Sciabordi) who he grows attached too. The four take the boy to an Italy family and end up surrounded by Germans. The movie brushes the topic of blacks fighting a war for a country that treats them like second class citizens a couple of times and is explicitly seen in a very well done scene were the four enter an ice cream parlor in Louisiana. The movie as a whole is not bad, but I was expecting a better ending to match the amazing beginning. The ending is probably the worst thing about the movie. It’s very contrived and looks like something out of a soap opera. The movie does have some good action scenes, but nothing as good as the action in Saving Private Ryan. The most intensity scene takes place at a church where the Nazis murder an entire community and burn the rest when they run out of bullets. The DVD is presented in 2.35:1 aspect ration preserving the theatrical presentation of the film. The picture is complemented with a 5.1 Dolby Digital audio in English Spanish and French. The special features don't exists in this DVD release. If you want to see some special features you should go for the Blu-ray version.